Lasers and photon drives have been a staple of science-fiction for 150 years. Now finally, laser-driven star probes are in the main-stream of science. Lasers are now advanced enough to help launch interstellar space probes, researchers say. Scientists calculate that a gram-sized laser-propelled space probe could reach more than 25 percent of the speed of light and arrive at the nearest star in about 20 years. The Voyager 1 spacecraft launched in 1977 is finally leaving the solar system after 37 years of flight at a speed of roughly 38,000 miles per hour or less than 0.006 percent the speed of light. This suggests that with conventional propulsion technology, humanity will never reach even the nearest stars, says experimental cosmologist Philip Lubin at the University of California, Santa Barbara. Lubin and his colleagues suggest that, instead, lasers could accelerate small probes to relativistic — that is, near-light — speeds, reaching nearby stars in a human lifetime. “No other current technology offers a realistic path forward to relativistic flight at the moment,” Lubin says. The problem with all thrusters that current spacecraft use for propulsion is that the propellant they carry with them and use for thrust has mass. Interstellar spacecraft require a lot of propellant, which makes them heavy, which requires more propellant, making them heavier, and so on. Photon drives instead involve equipping spacecraft with mirrors and depending on distant light sources for propulsion. Solar sails rely on light from the sun, while laser sails count on powerful lasers. Lubin acknowledges that photon drives are nothing new — in a letter to Galileo Galilei in 1610, Johannes Kepler wrote, “Given ships or sails adapted to the breezes of heaven, there will be those who will not shrink from even that vast expanse.” What is new, Lubin says, is that recent, poorly appreciated breakthroughs in laser technology suggest they can now accelerate spacecraft to relativistic speeds. Breakthroughs in laser technology suggest they can now accelerate spacecraft to relativistic speeds. The advance that Lubin’s approach depends on involves laser arrays. Instead of building one extremely powerful laser — a technologically challenging feat — researchers now can build phased arrays that are made of a large number of relatively modest laser amplifiers that can sync up to act like a single powerful laser. This strategy also eliminates the need for a single giant lens, replacing it with a phased array of smaller optics. The researchers envision a phased array of currently existing kilowatt-scale ytterbium laser amplifiers that can scale up gradually, adding lasers over time. For instance, a current 1- to 3-kilowatt ytterbium laser amplifier is about the size of a textbook and weighs roughly 5 kilograms. Eventually, the scientists calculate that a 50- to 70-gigawatt array that is 10 kilometers by 10 kilometers large in Earth orbit could propel a gram-sized wafer-like spacecraft with a 1-meter-wide sail to more than 25 percent of the speed of light after about 10 minutes of illumination, which could reach Mars in 30 minutes and Alpha Centauri in about 20 years. The researchers suggest this array could launch roughly 40,000 relativistic wafer-sized probes per year — each “wafersat” would be a complete miniature spacecraft, carrying cameras, communications, power and other systems. A major problem with this strategy is braking — the researchers currently have no way to slow down these laser-driven spacecraft enough for them to enter into orbit around the distant planets that they are dispatched to. The first missions that accelerate to relativistic speeds may have to simply fly by targets and beam back their data via lasers, Lubin notes. Lubin notes there are many additional uses for such a laser array other than space exploration. For example, it could deflect asteroids away from Earth, or blast debris out of orbit to prevent it from threatening spacecraft, astronauts and satellites. They are currently testing to show that small lasers can stop asteroids from spinning. The researchers stress that they are not proposing to immediately build the largest system. They are currently testing small lasers on asteroid-like rock samples to show that such systems can stop asteroids from spinning, work that could help one day wrangle asteroids for exploration. If lasers are the only practical route for interstellar travel, Lubin and his colleagues suggest that alien civilization may currently use lasers to help explore the cosmos. They suggest that SETI projects should look for telltale signs of such technology. Lubin presented his latest work in a talk on January 25 at Harvard. Lubin however fails to mention how the Military-Industrial-Complex invested billions and billions of dollars to make lasers into a combat grade weapon, which lasers of this type obviously are. And who or whom would be allowed to construct them? For years “planet 9” referred to Pluto. Unfortunately, Pluto has been downgraded to dwarf-planet status, (in-spite of the spectacular fly-by of New Horizons). Now there is much speculation that Planet 9 is a cold gas giant, perhaps even a small brown dwarf. Power, Distance and Time are inextricably linked in rocketry. When leaving the Earth’s surface this is not so obvious, since all the sound and fury happens for a few minutes, and silence descends once the rocket enters orbit, free-falling indefinitely, at least until drag brings it back down. For slow journeys to the Moon, Near Earth Asteroids, Mars, Venus etc. the coasting Hohmann Transfer orbits and similar low-energy orbits, are all typically “sudden impulse” trajectories, where the engines fire for a few minutes to put a spacecraft on a months long trajectory. For trips further afield – or faster journeys to the nearer planets – the acceleration time expands to a significant fraction of the total journey time. Ion-drives and solar-sails accelerate slowly for months on end, allowing missions like “Dawn” which has successfully orbited two Main Belt objects, Ceres and Vesta, all on one tank of propellant. Given more power an electrical propulsion system can propel vehicles to Mars in 2-3 months, Jupiter in a year and Saturn in under 2. Exactly how good the performance has to be is the subject of this post. Firstly, an important concept is the Power-to-Mass ratio or specific power – units being kilowatts per kilogram (kW/kg). Any power source produces raw energy, which is then transformed into the work performed by the rocket jet. Between the two are several efficiency factors – the efficiency of converting raw heat into electricity, then electricity into jet-power, which includes the ionization efficiency, the nozzle efficiency, the magnetic field efficiency and so on. A solar array converts raw sunlight into electricity with an efficiency of between 20-25%, but advanced cells exist which might push this towards 40-50%. That is the Power-to-Mass ratio required is proportional to the displacement (distance) squared, and inversely proportional to the mission time cubed. For example, a 1 year mission to Jupiter requires 1,000 times the specific power of a 10 year mission. The minimum acceleration case is when acceleration/deceleration is sustained over the whole mission time. When acceleration is constant, it means a maximum cruise speed (i.e. actual speed of vehicle) of 2 times the average speed (defined as total displacement divided by total mission time). Another result, from a mathematical analysis I won’t go into here, is that the minimum specific power mission requires a cruise speed that is 1.5 times the average speed and an acceleration+deceleration time, t, that is 2/3 the total mission time T.
Remember that kinetic energy is 1/2.M.V^2, thus specific kinetic energy per unit mass is 1/2.V^2. The power required – which is work done per unit time – is a trade off between acceleration time and mission time. Say the mission time is 10 years. If all the acceleration is done in 1 year, then the cruise speed required is 1/0.95 times the average speed, but power is proportional to the speed squared divided by the acceleration time: P = (1/2).V^2/t = (1/2). (1/0.95)^2/1 ~ 0.55, whereas in the case of constant acceleration, the average specific power is (1/2). (2)^2/10 = 0.2. For the case of minimum power it’s (1/2)*(3/2)^2/(2/3*10) = 0.16875 – just 84.375% the constant acceleration case and ~31% the 1 year thrust time. So what does it take to get to Planet 9? If we use the distance of 700 AU to Planet 9, and a total trip time of 10 years, that means an average speed of 70 AU per year. To convert AU/yr to km/s, just multiply by 4.74 km/s, thus 331.8 km/s is needed. Cruise speed is then 497.7 km/s and the specific jet-power is 1.177 kW/kg, if we’re slowing down to go into orbit. Presently there are only conceptual designs for power sources that can achieve that sort of specific power. If we take 20 years to get there, the specific power is 0.147 kW/kg, which is a bit closer to possible. Space reactor designs typically boast a specific electrical power output of 50 W/kg to 100 W/kg. Gas-core nuclear reactors could go higher, putting out 2,000 – 500 W/kg, but our applied knowledge of gas-core reactors is limited. Designs exist, but no working prototypes have ever flown. 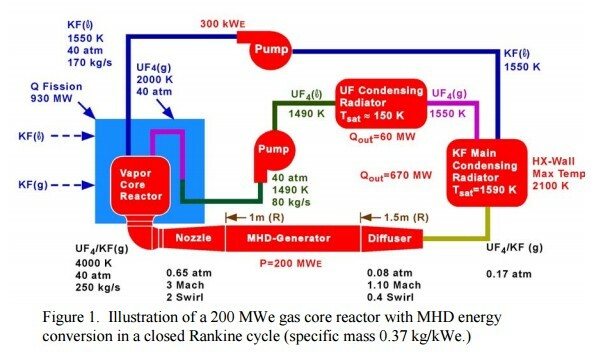 In theory it would use uranium tetrafluoride (UF4) gas as the reacting core, which would run at ~4000 K or so and convert heat to electricity via a magnetohydrodynamic (MHD) generator. Huge radiators would be required and the overall efficiency of the power source would be ~22%. In fact there’s a theorem that any thermal power source in space has its highest specific power when the Carnot efficiency is just 25%, thanks to the need to minimise radiator area by maximising radiator temperature. More exotic options would be the Fusion-Driven Rocket or a space-going stellarator or some such fusion reactor design with a high specific power. In that case it’d be operated more as a pure rocket than powering an electrical rocket. Of course there’s the old Orion option – the External Nuclear Pulse Rocket – but no one wants to put *potential* nuclear warheads into orbit, just yet. The bad news is I have not had much time to post. The good news is I have had a lot of time to watch stuff so expect several posts coming starting tomorrow. If I’m not watching my grandkids that is. Orbital ATK’s unmanned Cygnus spacecraft is set to embark upon its return-to-flight mission tonight (Dec. 3), carrying more than 7,700 lbs. (3500 kilograms) of research materials, crew supplies and hardware for the International Space Station — and you can watch the liftoff live. The Cygnus is scheduled to launch at 5:55 p.m. EST (2255 GMT) from Cape Canaveral Air Force Station in Florida aboard a United Launch Alliance Atlas V rocket, in the first liftoff for the freighter since Orbital’s Antares rocket exploded during a cargo delivery last October. (Cygnus will fly atop an Atlas V until a revamped version of Antares is ready to go.) The launch will initiate the fourth of eight resupply missions Orbital ATK is flying under a $1.9 billion contract with NASA. The live webcast of the OA-4 mission will begin at 4:30 p.m. EST (2130 GMT), and you can watch it here at Space.com, courtesy of NASA TV. As of this morning, there’s a 60 percent chance that weather conditions will be favorable for the launch, U.S. Air Force officials reported. If the launch occurs on schedule, the spacecraft will reach the space station Sunday, Dec. 6, where NASA astronaut Kjell Lindgren will take point on capturing it via the station’s Canadarm2 robotic arm, assisted by NASA astronaut Scott Kelly. If weather conditions worsen, the team will attempt to launch again tomorrow (Dec. 4) for a Dec. 7 or Dec. 8 arrival. Even though the Orbital ATK Cygnus freighter is on top of an ULA Atlas V rocket, this is an important flight for the Commercial Resupply Program. SpaceX and the Russian Progress plan return to launches within thirty days. The launch attempt was scrubbed before the window was officially closed due to deteriorating weather conditions. This is unusual, but not entirely expected when the probability of Go-for-Launch conditions dropped from 40% to 30% down to 10% throughout the day. The next launch window opens at 5:33pm ET tomorrow, again lasting for 30 minutes. The weather forecast remains grim, with only a 30% chance of acceptable conditions. If it also gets scrubbed, the mission has additional windows on December 5th and 6th before mission planners need to get creative. The star HIP 85605 until recently seemed more interesting than it may now turn out to be. 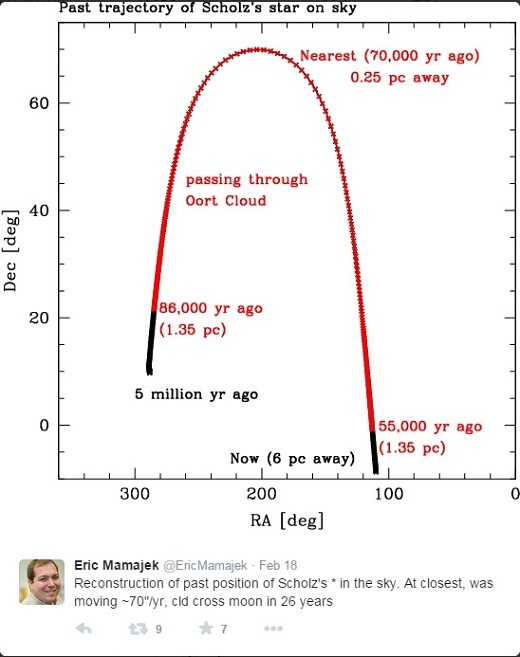 In a recent paper, Coryn Bailer-Jones (Max Planck Institute for Astronomy, Heidelberg) noted that the star in the constellation Hercules had a high probability of coming close enough to our Solar System in the far future (240,000 to 470,000 years from now) that it would pass through the Oort Cloud, potentially disrupting comets there. The possibility of a pass as close as .13 light years (8200 AU) was there, but Bailer-Jones cautioned that distance measurements of this star could be incorrect. His paper on nearby stellar passes thus leaves the HIP 85605 issue unresolved. Enter Eric Mamajek (University of Rochester) and company. Working with data from the Southern African Large Telescope (SALT) and the Magellan telescope at Las Campanas Observatory in Chile, Mamajek showed that the distance to HIP 85605 has been underestimated by a factor of ten. As Bailer-Jones seems to have suspected, the new measurement takes the star on a trajectory that does not bring it within the Oort Cloud. But in the same paper, the team names an interesting system called Scholz’s Star as a candidate for a close pass in the past. 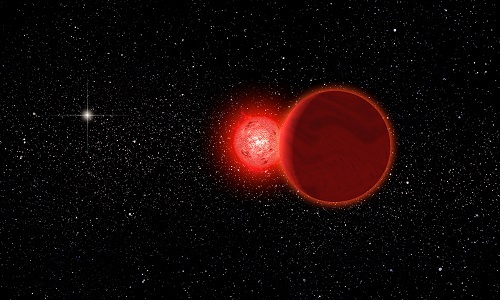 Image: Artist’s conception of Scholz’s star and its brown dwarf companion (foreground) during its flyby of the solar system 70,000 years ago. The Sun (left, background) would have appeared as a brilliant star. The pair is now about 20 light years away. Credit: Michael Osadciw/University of Rochester. The paper on this work, recently published in the Astrophysical Journal, determines the star’s trajectory, one that shows that about 70,000 years ago, it would have passed some 52,000 AU from the Sun. This works out to about 0.82 light years, or 7.8 trillion kilometers, quite a bit closer than Proxima Centauri, and probably close enough to pass through the outer Oort Cloud. The star was within 100,000 AU of the Sun for a period of roughly 10,000 years. Scholz’s star (W0720) is a low-mass object in the constellation Monoceros also tagged WISE J072003.20-084651.2 and only recently discovered (by Ralf-Dieter Scholz in 2014) thanks to its dimness in optical wavelengths, its proximity to the galactic plane and its low proper motion. Adaptive optics imaging and high resolution spectroscopy has demonstrated that the star is actually a binary, an M-dwarf with a companion at 0.8 AU that is probably a brown dwarf. If W0720 experienced occasional flares similar to those of the active M8 star SDSS J022116.84+194020.4 (Schmidt et al. 2014), then the star may have been rarely visible with the naked eye from Earth (V < 6; ∆V < −4) for minutes or hours during the flare events. Hence, while the binary system was too dim to see with the naked eye in its quiescent state during its flyby of the solar system ∼70 kya, flares by the M9.5 primary may have provided visible short-lived transients visible to our ancestors. And take a look at this graph, which Eric Mamajek published on Twitter yesterday. Past systematic searches for stars with close flybys to the solar system have been understandably focused on the Hipparcos astrometric catalog (García Sánchez et al. 1999; Bailer-Jones 2014), however it contains relatively few M dwarfs relative to their cosmic abundance. Searches in the Gaia astrometric catalog for nearby M dwarfs with small proper motions and large parallaxes (i.e. with small tangential velocities) will likely yield addition candidates. So much still to learn about M-dwarfs! 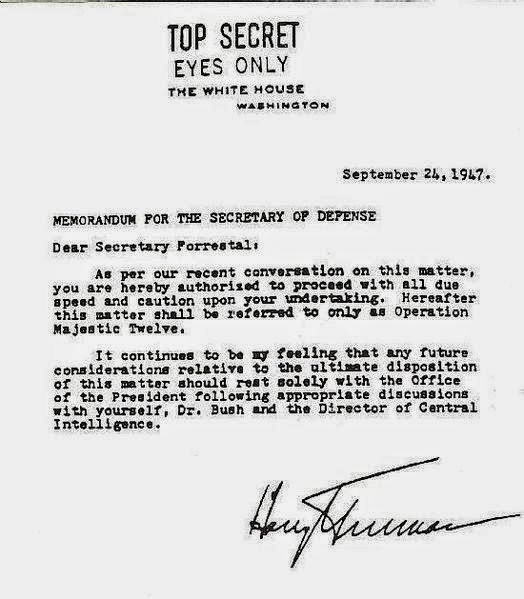 Majestic 12, Fact or Fiction? The purpose of the committee was stated in the Wilbert Smith memo to have been to investigate the slew of reports of “flying saucer” sightings that were then being received by U.S. military intelligence and in particular to look into the possible physics and technology of propulsion of the aerial objects that were being reported. 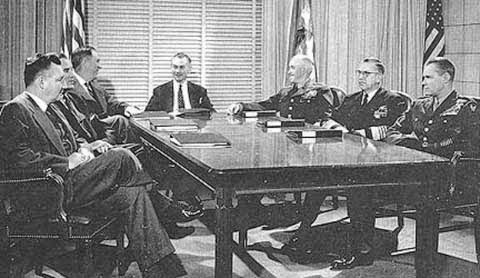 The formation of the committee is, because of the timing, widely believed to have been precipitated by the recovery of a UFO north of Roswell, New Mexico during 1947. Indications of MJ-12’s existence may have first appeared in 1978 in declassified Canadian documents naming Dr. Vannevar Bush as heading a highly secret UFO investigation group within the U.S. Research and Development Board. Since the first MJ-12 documents, thousands of pages of other leaked or declassified government documents mentioning MJ-12 and a government (including corporate elite) cover-up of UFOs have also appeared. All of them are controversial, and a few have been proven to be unquestionably fraudulent, usually retyped rewrites of unrelated government documents. The most notable “new” MJ-12 document is a lengthy, Linotype-set manual allegedly dating from 1954, called the MJ-12 “Special Operations Manual (SOM)”. It deals primarily with the handling of crash debris and alien bodies. Another government group recently associated with MJ-12 was the CIA’s Office of National Estimates or ONE, a forerunner of the current National Intelligence Council (NIC). 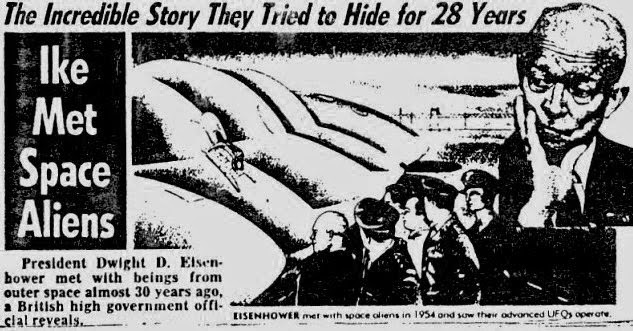 Researchers in the UFO community have circulated increased rumors in recent months that the meeting between Eisenhower and people from another planet took place in the early 1950’s. Eisenhower, who was president from 1953 to 1961, is known to have had a strong belief in life on other planets. The former five-star general in the United States Army who commanded the Allied Forces in Europe during the Second World War, was also keen on pushing the U.S. space program. His meeting with the cosmic life forms is said to have taken place while officials were told that he was on vacation in Palm Springs, California, in February 1954. The initial meeting is supposed to have taken place with aliens who were ‘Nordic’ in appearance, but the agreement was eventually ‘signed’ with a race called ‘Alien Greys’. I don’t know whether ol’ Ike was interested in other intelligent extraterrestrial beings or not, but he was sure interested in building spy satellites to scope out the USSR during the Cold War. After all these years tales of MJ-12 are still out for the jury to decide. American astronauts will soon have new homegrown rides into space. After a four-year competition, NASA has tapped the commerical spaceflight companies SpaceX and Boeing to launch astronauts to the International Space Station from U.S. soil by 2017, agency officials announced today (Sept. 16). If all goes according to plan, the two companies will reduce or end NASA’s dependence on Russia for its orbital taxi service. Russia’s Soyuz has been NASA’s only crew access to space since the space shuttle fleet retired in 2011. The choice reflects a melding of old and new; Boeing has been an aerospace mainstay for decades, while billionaire entrepreneur Elon Musk founded SpaceX just a dozen years ago, in 2002. NASA has picked SpaceX’s Dragon Version 2 manned spacecraft (left) and Boeing’s CST-100 space capsule to fly American astronauts to and from low-Earth orbit from U.S. soil for the first time since the shuttle fleet’s retirement in 2011. NASA announced the decision on Sept. 16, 2014 in a press conference at the Kennedy Space Center in Florida. SpaceX’s Dragon Version 2 spacecraft is a manned space capsule designed to fly seven astronauts to and from low-Earth orbit. See how SpaceX’s Dragon V2 spacecraft works in this Space.com infographic. NASA is looking to the private sector to fill the crew-carrying shoes of the space shuttle fleet, which was retired in 2011 after 30 years of orbital service. For the past three years, the agency has relied on Russian Soyuz capsules to fly its astronauts to and from space — recently, at a cost of more than $70 million per seat. NASA officials have said they want at least one American commercial vehicle to be up and running by late 2017. A domestic capability to and from low-Earth orbit could not only cut costs but also free the agency to work on getting people to more distant and difficult destinations such as Mars, Bolden said. Four companies have been major players in NASA’s ongoing commercial crew competition: SpaceX, Boeing, Blue Origin and Sierra Nevada. SpaceX and Boeing are building capsules called Dragon and the CST-100, respectively. Blue Origin has been developing a conical craft called the Space Vehicle, while Sierra Nevada’s entry was a space plane called Dream Chaser. Like SpaceX, Blue Origin is led by a billionaire — in this case, Amazon.com founder Jeff Bezos. Today’s announcement apparently takes Blue Origin and Sierra Nevada out of the mix, but it doesn’t eliminate competition from the commercial crew program. Under the CCtCap contracts, both Boeing and SpaceX will be required to go through a rigorous certification process, which will include at least one manned demonstration mission to the space station, NASA officials said. “NASA is committed to ensuring these systems are held to the same rigorous safety standards as previous human spaceflight programs,” said NASA commercial crew program manager Kathy Lueders. After completing certification, Dragon and the CST-100 will each fly at least two, and perhaps as many as six, crewed NASA missions to and from the space station, Lueders added. Each of these crewed flights will carry four astronauts. NASA will continue using both capsules as long as they meet the agency’s requirements, Bolden said. Boeing is developing the CST-100 capsule for use ferrying astronauts to Earth orbit and to the International Space Station. See how Boeing’s CST-100 spacecraft works in this Space.com infographic. Dragon is an upgraded, manned version of the robotic capsule SpaceX uses to fly cargo missions to the space station under a separate, $1.6 billion NASA contract. The crew capsule will ride to space aboard SpaceX’s Falcon 9 rocket, as the cargo variant does. The CST-100, meanwhile, will be lofted by United Launch Alliance’s Atlas 5 rocket. The Atlas 5 currently uses a Russian RD-180 engine, but that may change soon; United Launch Alliance — a joint venture of Boeing and Lockheed-Martin — is reportedly tapping Blue Origin to build a new, homegrown engine for the rocket. Both capsules will launch from NASA’s Kennedy Space Center in Florida, officials said. It’s too bad Sierra Nevada didn’t get a little money thrown its way, it would’ve been nice to have a mini-shuttle flying by 2017. All in all, SpaceX has the most modern capsule design and it will serve NASA and commercial concerns for many years. 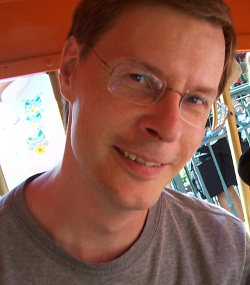 Here is another great post from Centauri Dreams, written by Andreas Hein. Good stuff. 2089, 5th April: A blurry image rushes over screens around the world. The image of a coastline, waves crashing into it, inviting for a nice evening walk at dawn. Nobody would have paid special attention, if it were not for one curious feature: Two suns were mounted in the sky, two bright, hellish eyes. The first man-made object had reached another star system. Is it plausible to assume that we could send a probe to another star within our century? One major challenge is the amount of resources needed for such a mission. [1, 2]. Ships proposed in the past were mostly mammoths, weighing ten-thousands of tons: the fusion-propelled Daedalus probe with 54,000 tonnes and recently the Project Icarus Ghost Ship with over 100,000 tonnes. All these concepts are based on the rocket principle, which means that they have to take their propellant with them to accelerate. This results in a very large ship. Another problem with fusion propulsion in particular is the problem of scalability. Most fusion propulsion systems get more efficient when they are scaled up. There is also a critical lower threshold for how small you can go. These factors lead to large amounts of needed propellant and large engines, for which you need a large space infrastructure. A Solar System-wide economy is probably needed, as the Project Daedalus report argues . However, there is a different avenue for interstellar travel: going small. If you go small, you need less energy for accelerating the probe and thus less resources. Pioneers of small interstellar missions are Freeman Dyson with his Astrochicken; a living, one kilogram probe, bio-engineered for the space environment . Robert Forward proposed the Starwisp probe in 1985 . A large, ultra-thin sail which rides on a beam of microwaves. Furthermore, Frank Tipler and Ray Kurzweil describe how nano-scale probes could be used for transporting human consciousness to the stars [6, 7]. Laser sail propulsion: The spacecraft rides on a laser beam, which is captured by an extremely thin sail . Distributed spacecraft: To spread out the payload of a larger spacecraft over several spacecraft, thus, reducing the laser power requirements [9, 10]. The individual spacecraft would then rendezvous at the target star system and collaborate to fulfill their mission objectives. For example, one probe is mainly responsible for communication with the Solar System, another responsible for planetary exploration via distributed sensor networks (smart dust) . Magnetic sails: A thin superconducting ring’s magnetic field deflects the hydrogen in the interstellar medium and decelerates the spacecraft . Solar power satellites: The laser system shall use space infrastructure which is likely to exist in the next 50 years. Solar power satellites would be temporarily leased to provide the laser system with power to propel the spacecraft. 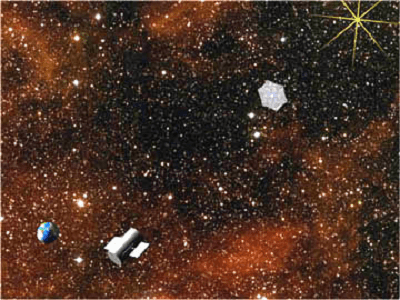 Communication systems with external power supply: A critical factor for small interstellar missions is power supply for the communication system. As small spacecraft cannot provide enough power for communicating over these vast distances. Thus, power has to be supplied externally, either by using laser or microwave power from the Solar System during the trip and solar radiation within the target star system . Bringing all these technologies together, it is possible to imagine a mission which could be realized with technologies which are feasible in the next 10 years and could be in place in the next 50 years: A set of solar power satellites are leased for a couple of years for the mission. A laser system with a huge aperture has been put into a suitable orbit to propel the interstellar, as well as future planetary missions. Thus, the infrastructure can be reused for multiple purposes. The interstellar probes are launched one-by-one. After decades, the probes start to decelerate by magnetic sails. Each spacecraft charges its sails differently. The first spacecraft decelerates slower than the follow-up probes. Ideally, the spacecraft then arrive at the target star system at the same point in time. Then, the probes start exploring the star system autonomously. They reason about exploration strategies, exchange and share data. Once a suitable exploration target has been chosen, dedicated probes descend to the planetary surface, spreading dust-sized sensor networks onto the pristine land. The data from the network is collected by other spacecraft and transferred back to the spacecraft acting as a communication hub. The hub, powered by the light from extrasolar light sends back the data to us. The result could be the scenario described at the beginning of this article. Of course, one of the caveats of such a mission is its complexity. The spacecraft would have to rendezvous precisely over interstellar distances. Furthermore, there are several challenges with laser sail systems, which have been frequently addressed in the literature, for example beam collimation and control. Nevertheless, such a mission architecture has many advantages compared to existing ones: It could be realized by a space infrastructure we could imagine to exist in the next 50 years. The failure of one or more spacecraft would not be catastrophic, as redundancy could easily be built in by launching two or more identical spacecraft. The elegance of this mission architecture is that all the infrastructure elements can also be used for other purposes. For example, a laser infrastructure could not only be used for an interstellar mission but interplanetary as well. Further applications include an asteroid defense system . 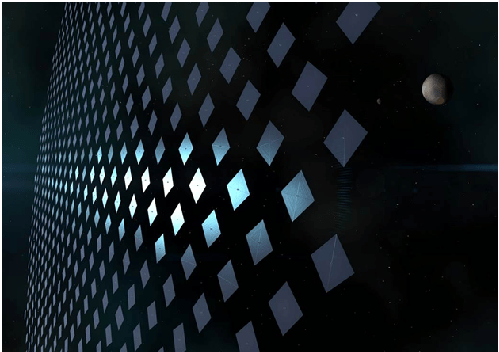 The solar power satellites can be used for providing in-space infrastructure with power . The increased availability of highly sophisticated miniaturized commercial components: smart phones include many components which are needed for a space system, e.g. gyros for attitude determination, a communication system, and a microchip for data-handling. NASA has already flown a couple of “phone-sats”; Satellites which are based on a smart phone . Advances in distributed satellite networks: Although a single small satellite only has a limited capability, several satellites which cooperate can replace larger space systems. The concept of Federated Satellite Systems (FSS) is currently explored at the Massachusetts Institute of Technology as well as at the Skolkovo Institute of Technology in Russia . Satellites communicate opportunistically and share data and computing capacity. It is basically a cloud computing environment in space. Increased viability of solar sail missions. A number of recent missions are based on solar sail technology, e.g. 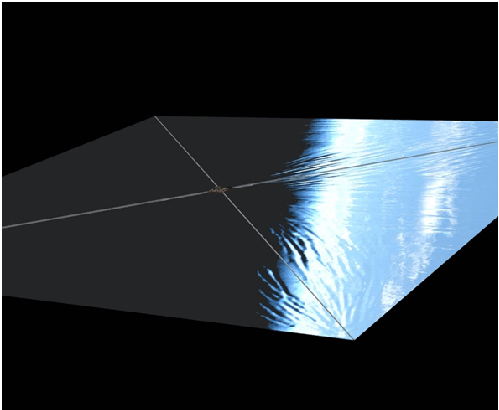 the Japanese IKAROS probe, LightSail-1 of the Planetary Society, and NASA’s Sunjammer probe. Greg Matloff recently proposed use of Graphene as a material for solar sails . With an areal density of a fraction of a gram and high thermal resistance, this material would be truly disruptive. Currently existing materials have a much higher areal density; a number crucial for measuring the performance of solar sails. Material sciences has also advanced to a degree where Graphene layers only a few atoms thick can be manufactured . Thus, manufacturing a solar sail based on extremely thin layers of Graphene is not as far away as it seems. Small satellites with a mass of only a few kilograms are increasingly proposed for interplanetary missions. NASA has recently announced the Interplanetary CubeSat Challenge, where teams are invited to develop CubeSat missions to the Moon and even deeper into space (NASA) . Coming advances will thus stretch the capability of CubeSats beyond Low-Earth Orbit. Recent proposals for solar power satellites focus on providing space infrastructure with power instead of Earth infrastructure [18, 19]. The reason is quite simple: Solar power satellites are not competitive to most Earth-based alternatives but they are in space. A recent NASA concept by John Mankins proposed the use of a highly modular tulip-shaped space power satellite, supplying geostationary communication satellites with power. 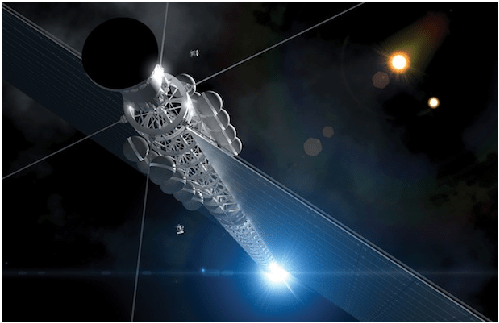 In order to explore various mission architectures and encourage participation by a larger group of people, I4IS has recently announced the Project Dragonfly Competition in the context of the Alpha Centauri Prize . We hope that with the help of this competition, we can find unprecedented mission architectures of truly disruptive capability. Once this goal is accomplished, we can concentrate our efforts on developing individual technologies and test them in near-term missions. If this all works out, this might be the first time in history that there is a realistic possibility to explore a near-by star system within the 21st or early 22nd century with “modest” resources. I remember when the original Project Icarus study came out in the 1970s and I was absolutely enthralled with it. At last, interstellar exploration could be possible, not fantasy. Then the Icarus came out a couple of years ago. The ship was more advanced, but the size doubled. How is that possible in this age of miniaturization? I think it’s because people love the idea of Battlestar Galactica or U.S.S. Enterprise sized interstellar craft. You gotta have powerful engines and weapons to cope with angry aliens, right? Andrea Hein is being smart and paying respect to Robert Foward and Freeman Dyson by writing this study with up to date ideas which encompasses Cube Sat tech and other commercial space company technologies. Of course Shostak takes the long, sensor derived view of exploring the Universe, his life’s work is radio telescopes. Gilster is correct that interferometry will be an adjunct to sending robotic probes to distant interstellar worlds, you can’t make money by just gawking at places. I discovered Karl Schroeder’s work when I was researching brown dwarfs some years ago. Who knew that somebody was writing novels about civilizations around these dim objects? Permanence (Tor, 2003) was a real eye-opener, as were the deep-space cultures it described. Schroeder hooked me again with his latest book — he’s dealing with a preoccupation of mine, a human presence in the deep space regions between ourselves and the nearest stars, where resources are abundant and dark worlds move far from any sun. How to maintain such a society and allow it to grow into something like an empire? Karl explains the mechanism below. Science fiction fans, of which there are many on Centauri Dreams, will know Karl as the author of many other novels, including Ventus (2000), Lady of Mazes (2005) and Sun of Suns (2006). My newest science fiction novel, Lockstep, has just finished its serialization in Analogmagazine, and Tor Books will have it on the bookshelves March 24. Reactions have been pretty favourable—except that I’ve managed to offend a small but vocal group of my readers. It seems that some people are outraged that I’ve written an SF story in which faster than light travel is impossible. I did write Lockstep because I understood that it’s not actual starflight that interests most people—it’s the romance of a Star Trek or Star Wars-type interstellar civilization they want. Not the reality, but the fantasy. Even so, I misjudged the, well, the fervor with which some people cling to the belief that the lightspeed limit will just somehow, magically and handwavingly, get engineered around. This is ironic, because the whole point of Lockstep was to find a way to have that Star Wars-like interstellar civilization in reality and not just fantasy. As an artist, I’m familiar with the power of creative constraint to generate ideas, and for Lockstep I put two constraints on myself: 1) No FTL or unknown science would be allowed in the novel. 2) The novel would contain a full-blown interstellar civilization exactly like those you find in books with FTL.